Despite decades of research, the agent responsible for transmitting spongiform encephalopathies (TSEs) has not been identified. The Prion hypothesis, which dominates the field, supposes that modified host PrP protein, termed PrPSc, acts as the transmissible agent. This model fits the observation that TSE diseases elicit almost no immune reaction. Prion transmission has not been verified, however, as it has not been possible to produce pure PrPSc aggregates. One long-standing objection to the Prion model is the observation that TSE disease agents show classical genetic behaviours, such as reproducible strain variation, while also responding to selection for novel traits such as adaptation to new hosts. Moreover, evidence has been steadily accumulating that infectious titre is decoupled from the quantity (or even the presence) of PrPSc deposits. Rather awkwardly for the Prion hypothesis, PrP0/0 knockout mice have been found to incubate and transmit TSE agents (despite themselves being refractory to TSE disease). In this article, a new scheme, RuNAway, is proposed whereby uncontrolled proliferation of a type of parasitic gene, the small dispersed repeat sequences (SINEs), in somatic cells induces overproduction of PrP with pathogenic consequences. The RuNAway scheme involves twin tandem positive feedback loops: triggering the second loop leads to the pathogenic disease. This model is consistent with the long latency period and much shorter visible disease progression typical of TSEs. TSE diseases include Creutzfeldt-Jakob disease (CJD), Kuru and Gerstmann-Sträussler-Scheinker syndrome (GSS) in humans, scrapie in sheep and bovine spongiform encephalopathy (BSE). They may arise sporadically, as is typical of CJD onset in elderly people, but are then transmissible by injection or ingestion of infected material (reviewed in refs: [1, 2]). Experimental transfer of TSEs between mammalian species typically reveals a "species barrier": Initial inoculation causes a mild disease, if any, but serial passage in the new species establishes a much more virulent TSE adapted to the new host. Many species of mammal appear susceptible to TSEs. As a consequence of the Prion transmission model , most studies aimed at understanding TSEs have focussed on the GPI-linked cell surface protein PrP (OMIM entry:176640). This focus has yielded important benefits, and it is known from transgenic mouse studies that simply overexpressing PrP leads to PrPSc deposits which cause spongiform-like disease [4, 5] although these deposits have not been shown to be infectious. Numerous polymorphisms in the PrP protein sequence are also known to strongly influence both TSE disease susceptibility and progression (e.g. Refs: [6, 7]). Transgenic mice devoid of PrP appear to be completely resistant to the pathological effects of TSE infection . It is therefore well established that PrPSc protein deposits, in the form of amyloid plaques, are a direct cause of brain damage in TSEs. By analogy with recent results in Alzheimer's disease , immunisation with PrPSc deposits may enable the immune system to clear the deposits, suggesting a potential therapeutic strategy to hinder disease progression. With regard to PrPSc and TSE transmissibility, however, results have been highly inconsistent, with several groups reporting that infectious titre is not correlated to quantity of PrPSc deposition [10,11,12]. Most disquietingly, it has been shown that apparently resistant hosts can replicate infectious TSE agent, without any symptoms developing in the host animal and even that PrP0/0 knockout mice can incubate and pass on the transmissible agent . Curiously, there also appears to be an endemic agent in healthy humans that can induce CJD-like spongiform disease in hamsters . From natural scrapie transmission in sheep, it is understood that an infectious agent is needed in addition to an appropriate PrP genotype for disease to develop . In summary, the TSE agent appears to be endemic, yet infectious, is present in many mammalian species but is not encoded by the PrP gene. If the infectious agent is not a Prion, it must still obey a number of experimentally determined constraints. It must be capable of being replicated in somatic cells of mammals. It should be an endogenous entity, since it does not elicit an immune reaction. It should be a relatively small molecule (the smallest known viral genome or smaller) based on the kinetics of inactivation by irradiation, chemical or heat treatment [17,18,19] and the observation that peak infectivity migrates on gels in the size range of tRNA and viroids . It should have genetic properties. There is a class of molecule compatible with these constraints, the abundant short dispersed repeats found in vertebrate genomes. Mammalian genomes typically contain many hundreds of thousands of short interspersed nuclear elements, or SINEs, such as the human Alu and ruminant Bov-tA sequences (reviewed in Refs: [21,22,23]). It is estimated that there are about 1,000,000 Alus per haploid human genome . Some 40-60% of the human genome is derived from repetitive elements including Alus . Alu sequences are partially related to the 7S RNA of the signal recognition particle SRP. SINEs in primates and rodents generally are derived from 7S, whereas in most mammals, including domestic ungulates, SINEs instead show sequence homology with tRNAs . SINEs proliferate in the genome via retrotransposition using reverse transcriptase and endonuclease activities encoded by larger LINE family repetitive elements . SINE genes possess internal RNA Polymerase III promoters so that newly inserted SINEs may be immediately transcribed - though the chromosomal context will influence this. SINEs are primarily parasitic in nature although as they are germline transmitted, requiring coexistence with their hosts for hundreds of millions of years, it has been proposed that they have evolved a symbiotic role in regulating protein synthesis in stressed cells . In normal cells, SINE genes are transcribed at low levels with high turnover of transcripts, so that SINE RNAs are in low abundance . To be transmitted in the host genome, retrotransposition of repeats must occur in germline or early embryogenesis. Since the replication cycle of SINEs is decoupled from cellular genome replication, individual SINEs are under positive selection to spread through a cellular genome and somatic retroposition also occurs . Within any particular cell, "improved fitness" for a SINE will be more efficient replication and therefore mutations that improve steps such as transcription, mRNA stability, priming for reverse transcription or integration into the genome will be selected. Germline transmission leads to counter selection at the host organismal level, suppressing variants that affect the host's health and reproduction. Two characteristics of SINEs are especially noteworthy with respect to TSE diseases. Firstly, when cells are stressed (e.g. 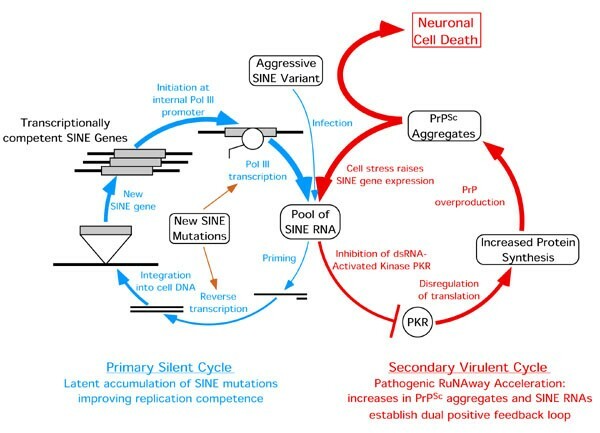 by heat or chemical shock or viral infection), SINE gene transcription increases dramatically and SINE RNAs may become orders of magnitude more abundant [26,27,28]. Secondly, SINE RNAs directly affect protein synthesis by binding and inhibiting the dsRNA-activated kinase PKR (eIF2α kinase) . PKR is involved in cellular antiviral defense, the activated kinase shutting down cellular translation in the presence of long dsRNAs . By inhibiting PKR, high concentrations of SINE RNAs can cause concomitant increases in protein synthesis [21, 29]. Figure 1 shows a new scheme wherein two intersecting positive feedback loops would allow SINEs to operate as the causative agents in TSEs. In the first latent cycle, SINEs are iteratively selected for more efficient replication. New mutations arise during error-prone reverse transcription (and at a lower rate during RNA Pol. III transcription). Proliferation of replication competent SINE genes results in increased SINE RNA concentration. Since initial RNA concentrations are low and SINE retrotranspositions are rare, several rounds of improvement will need to be completed and the latent period for spontaneous TSE disease will be long, normally exceeding the lifetime of the organism. The cycle time and latent period would, however, be shortened by infection with an aggressively replicating SINE variant. Eventually the SINE RNA concentration will increase sufficiently that it begins to shut down cellular PKR activity, leading to generally increased protein synthesis. This engages the second, much more virulent pathogenic cycle. Increased protein synthesis raises PrP production to the point at which PrPSc aggregates begin to form between cells. Cells become stressed by the PrPSc deposits, leading to a massive increase in SINE gene transcription, further feeding the cycle. Because of the central role of SINE RNA concentration in this process, the term "RuNAway acceleration" encapsulates this scheme. The RuNAway disease scheme. In the primary latent cycle (blue), a clone of SINE genes gradually escapes from the default state of heavily suppressed replication. Sources of new mutations (orange) are provided by RNA Pol. III and the error-prone reverse transcriptase. Mutations that improve retroposition competence are iteratively incorporated into new genes, leading to shorter cycle times. As newly inserted SINE genes proliferate, SINE RNA concentration increases, which may be aided by mutations that hinder SINE RNA turnover. A new infection by an aggressively replicating SINE variant will result in rapid cycles of gene proliferation and a shorter latent period. Eventually, SINE RNAs begin to titrate out the cellular pool of PKR, causing the initiation of the secondary virulent cycle (red). Overproduction of PrP protein leads to PrPSc deposits that stress the cell. In turn this induces massive transcription of inherited SINE genes, ensuring that PKR remains fully inhibited. The double positive feedback nature of the virulent cycle ensures that it will only be terminated by cell death. The RuNAway process could occur in any cell type, but will particularly affect long-lived terminally differentiated cell types such as neurones, just as is seen with TSE diseases. To be infectious, the SINE nucleic acid, as RNA, DNA or both, must be readily transferred between cells (although the process does not need to achieve virus-like efficiency). Although the transfer mechanism between cells would need to be elucidated, present uncertainty about the mechanism of cell entry cannot be used to decisively reject the RuNAway scheme, as it has recently become clear that nucleic acid can be taken up by animal cells. Thus antisense oligonucleotides are taken up by animal cells by endocytosis, albeit inefficiently. More dramatically, in genetic silencing experiments , double-stranded RNAi spreads throughout the nematode worm Caenorhabditis elegans if it is injected into the body cavity , if the worm is bathed in dsRNA preparations , or even if the dsRNA is expressed in Escherichia coli that is then ingested . Proponents of nucleic acid TSE agents have long assumed that virally-mediated infection must occur  but the RNAi findings suggest that this need not be considered a requirement. In summary, the two cycles of the proposed RuNAway disease scheme fit well to the TSE progression, with the primary silent cycle corresponding to the latent period of infection followed by a transition to the second virulent cycle coinciding with the onset of pathological disease symptoms. Table 1 lists features of TSE diseases for which the RuNAway model can provide an explanation. According to the RuNAway model, the PrP0/0 mice must be capable of infection by the TSE agent, yet they should not succumb to the infection as they cannot engage the second cycle to make PrPSc: the model is consistent with these experimental findings . SINE elements have the required characteristics of the transmissible agent: they are small, can replicate in somatic cells, and, being solely composed of nucleic acid, will exhibit reproducible genetic behaviour yet will not elicit an immune reaction when infected into a new host. Of possible significance for the RuNAway model, an abundant small RNA, equivalent in size to the major processed SINE transcripts, has been observed in scrapie-infected hamster brains , though not characterised in detail. To conclude, the simple RuNAway scheme described here is testable and can provide a framework for cell fractionation approaches aimed at isolating the transmissible agents in TSE diseases. The scheme predicts that transfer of a TSE between species will lead to copies of a repetitive element present in the infected source material being multiply inserted into the genomes of newly infected cells and then being expressed as cellular RNA. Identification of a nucleic acid agent for TSEs would enable the development of sensitive tests for the early stages of BSE infection in symptom-free cattle.